"Enemy to those who make him an enemy. Friend to those who have no friend." 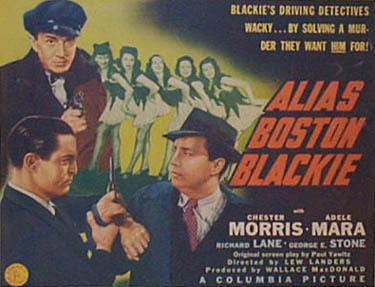 This is the third movie in the Boston Blackie series. 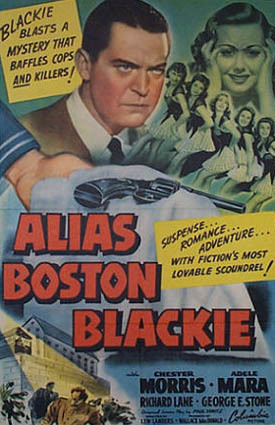 Blackie tracks down an escaped convict so he can prove the man is innocent. Boston Blackie arranges a Christmas a magic spectacle at the state prison the prisoners. The entertainment is by a musical comedy company troupe staring Roggi McKay, the famous clown, and a young dancer, Eve Sands, whose brother, Joe Trilby, is an inmate at the institution. Joe, who was framed and now wants revenge, overpowers Roggi backstage and changes into the clown's clothes and makeup while the prisoners and guards are watching the show. Joe, posing as Roggi, boards the bus with the rest of the troupe and returns to the city and escapes. Farraday thinks Blackie is involved in the escape and tries to arrest him but Blackies escapes. Blackie tries to warn Duke Banton, one of the men that framed Joe but finds him shot when he get there. Farraday arrives and arrests Blackie again but Blackie escapes again. Blackie has got to find Joe before he finds the Steve Caveroni, the other man, or something happens to Joe's sister Eve. Prompted by the sentiment of Christmas, reformed safecracker Boston Blackie persuades the cast of a musical comedy company to help him entertain the inmates at his "alma mater," the state prison. The stars of the troupe are Roggi McKay, the famous clown, and a young dancer, Eve Sands, whose brother, Joe Trilby, is an inmate at the institution. Eve is anxious to see her brother, who was jailed on false evidence and who now he seeks revenge on Duke Banton and cab driver Steve Caveroni, the two men who framed him. To make sure that Blackie and his sidekick, The Runt, do not cause any trouble, Inspector Farraday and Detective Mathews accompany them on the bus trip to the prison. While the prisoners and guards are watching the performance, Joe overpowers Roggi in a backstage office and changes into the clown's clothes and makeup. When the show ends, Joe, posing as Roggi, boards the bus with the rest of the troupe and returns to the city. Back at the theater, Blackie and Eve discover Joe's deception, but he escapes. Trailing the fugitive to Eve's hotel, Blackie tries to dissuade him from his scheme to kill Duke and Caveroni. Joe refuses to listen, however, and at gunpoint, he takes Blackie's clothes, leaving him bound and gagged. Soon after, Eve returns home and frees Blackie. After Blackie puts on the clown suit, he and Eve return to his apartment. There he tells Runt to call Jumbo Madigan, a fence, to find out Duke's address. Meanwhile, the police have discovered Joe's prison break and hurry to question Blackie. When Farraday tries to arrest Blackie, he and Runt escape. Hoping to warn Joe's victims, Blackie goes to Duke's hotel, whose address he obtained from Jumbo, and he finds Duke shot to death. Minutes later Joe arrives, angry over being cheated of his revenge. When the police pound at the door, Runt and Blackie hide Joe under the couch, and he later escapes by changing places with Duke's body, which is under a sheet covering a stretcher. Blackie manages to hide Duke's body in a folding bed before Farraday arrests him and takes him to headquarters. Outwitting his guards, Blackie makes a break from the police station with Eve and goes to meet Joe, who is hiding at the mansion owned by Arthur Manleder, Blackie's eccentric millionaire friend. Blackie traces the cab driver's license that he found at the scene of Duke's murder to Caveroni. Setting a trap for Caveroni, Blackie instructs Eve to hail Caveroni's cab and take it to the hotel where Duke's body is hidden. Eve asks Caveroni to carry her bag to her room, and when he opens the door, he is met by Blackie, who confronts him with the corpse and accuses him of murder. Meanwhile, Farraday returns to the hotel, alerted by the ambulance driver's report of a missing corpse. Outside the hotel room door, Farraday listens as Caveroni confesses to killing Duke because Duke was planning to frame him and admits that he and Duke framed Joe. Trying to escape, Caveroni runs out the door, takes the elevator to the lobby and jumps in his cab, but is shot by the police. Joe is cleared of all charges, and at a Christmas party, he toasts Blackie and Farraday as the "two best cops in the world."